Download a free printable copy of this card. (You, of course, will insert your own photo) The easy to follow instructions are below. Let everyone know about the new precious addition to your family, with a handmade card from you. One digital baby photo, or wallet size 2.5 x 3.5 baby photo print. Print out Front and back inserts of the card onto bright white cardstock, if you are using a digital image place the image onto a bottom layer with your digital imaging software, otherwise just print out and then cut out 2.25 x 3.25 in square and place wallet size print behind the cutout hole. Attach photo by running a little bit of glue runner on the edge of the photo. Cut out front carefully with X-Acto knife and ruler. Use bone folder and ruler to score fold in the middle. Fold the front of the card in half. 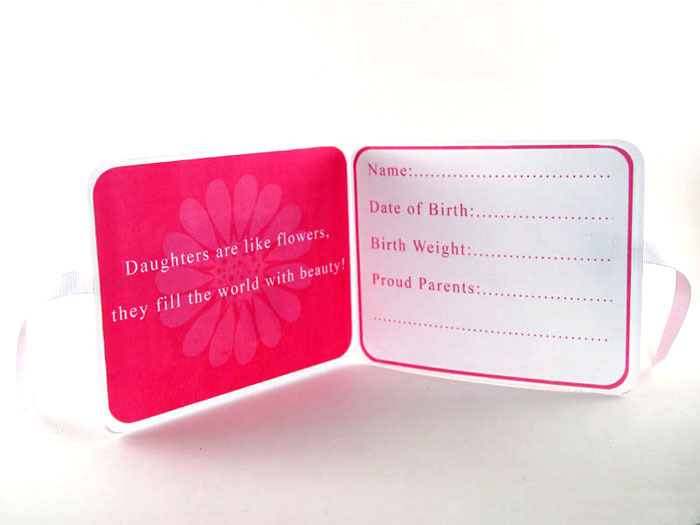 Use 10mm corner punch to round out all corner of the card. Cut out inserts with X-Acto knife and ruler, then use corner punch on all corners. Cut a 3/8 inch slit onto the middle right and left sides of the front of the card. Cut two lengths of white grosgrain ribbon about 4 inches long. Insert each ribbon into slits from the front and attach to back with a little bit of glue from glue runner. Run glue along the back edges of both inserts and place onto the inside of the card. Use the photos above for placement guidance.